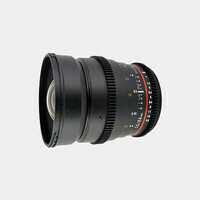 This 20mm is a Super wide-angle lens with a large aperture of f/1.8 and angle of view 94.5°. It has Macro focusing capability with a minimum focusing distance of just 7.9", for a reproduction ratio of 1:4. The 9-bladed iris diaphragm obtains beautiful out of focus image characteristics. Aspherical lens elements in the front & rear lens groups minimize distortion, spherical aberration and astigmatisms. The lens has non-vignetting optical construction in order to obtain adequate peripheral brightness with wide apertures-especially desirable for digital cameras. The lens incorporates a rear focus system eliminating front lens rotation. The focusing ring does not rotate during autofocus yet provides adequate focusing torque of the focusing ring during manual focusing of the lens.